Each year at our annual conference, the Worksite Wellness Council of Louisville hosts a day full of educational speakers, networking, and connections to local health and wellness resources. We also present awards to organizations that strive to create cultures of health through wellness policies and programs for their employees. If your organization has a worksite wellness program, no matter how minor or comprehensive, we want to know the great things that are happening at your organization. 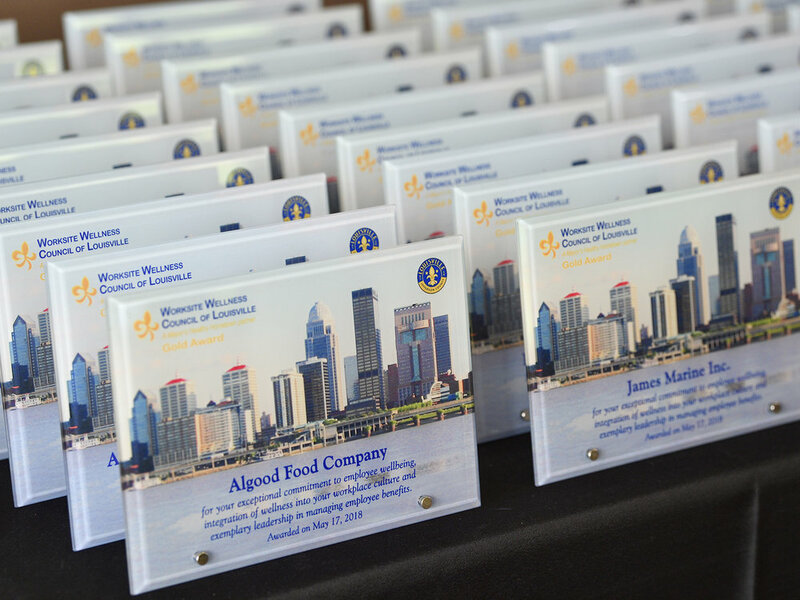 This year’s Worksite Wellness Council of Louisville Conference & Awards event was a success! We also heard from many inspiring speakers including our keynote address from Ann Coffey who discussed her experience as an advanced mountain climber, a talk that was the inspiration for our conference theme “Wellness Elevated.” The day was filled with great networking and learning from all of our sponsors as we had new question and answer guidebook that helped keep things engaging. We were also treated to a some relaxation in the “Serenity” themed room. This year's speakers were incredibly dynamic. The morning kicked-off with Todd Shickel discussing how to help employees break the "paycheck to paycheck" cycle. Just before lunch an energetic Julius Rhodes spoke about personal branding. Then the "peak" of the day was hearing from Ann Coffey and her lessons learned from her mountain climbing experiences. If you weren't able to attend or would like to review a copy of our speakers' presentations click below. Congratulations to all of this year's winners. We had over 60 applicants this year and recognized 49 awardees from all across Kentucky. We were pleased to have Mayor Greg Fischer and Dr. Jim Frazier, Vice President of Medical Affairs of Norton Healthcare to present this year's awards. To see them all just click below. This year’s conference helped educate attendees on how they can elevate themselves and their programs to the next level. This year we highlighted our top sponsors so you could really get to know them. We asked them to share why they do wellness. Why is wellness integrated into their company and why is it important to them. Read their answers here.